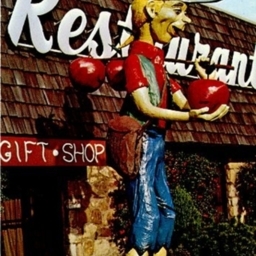 Postcard photograph showing the Johnny Appleseed figure in front of the Johnny Appleseed Restaurant & Lounge in New Market Virginia. The restaurant, located adjacent to the Quality Inn, operated from 1972 until 2016. 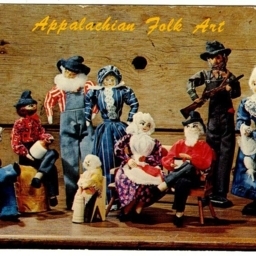 Color postcard with a picture of Appalachian Folk Art dolls.